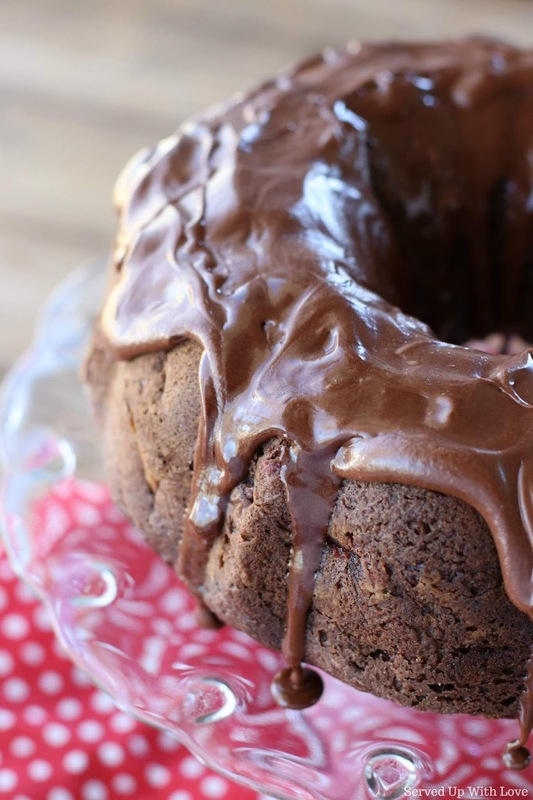 Chocolate cake and cherry pie filling blend together to make the most scrumptious bundt cake. You can't get much easier than this cake. It all starts with a cake mix. Yes, I said cake mix. Seriously though, you would never even know this is a cake mix. 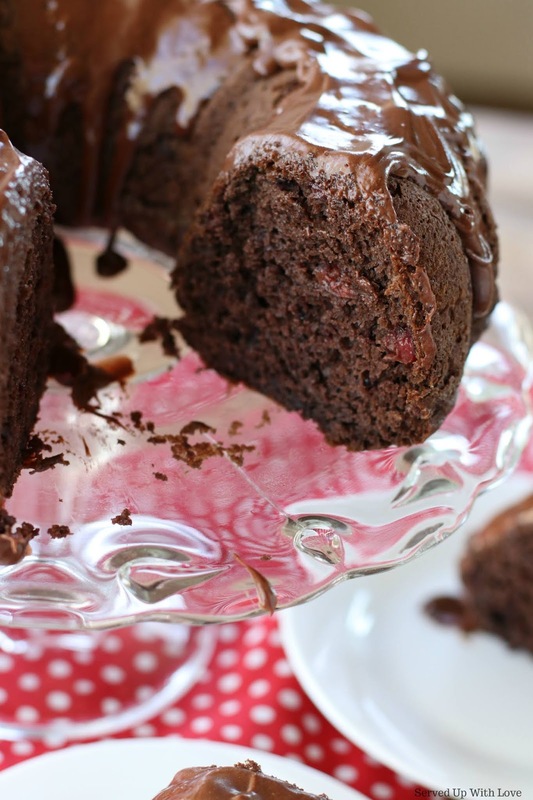 You make the cake by combining a box of fudge cake mix with eggs and cherry pie filling. No need to add the water or oil that the mix calls for, just the eggs, pie filling, and almond extract. 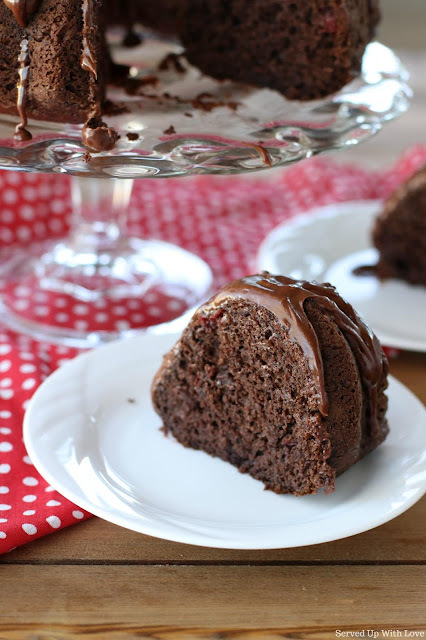 You can certainly make this in a 9 x 13 pan or make into a layered cake but I just prefer a bundt cake. It is just something about a bundt cake. It just elevates a plain ol' cake into something spectacular. While going through my mom's stuff, I came across my grandma's cake stand. I have a slight obsession with cake stands and just had to have it. Now when I use it I think of my grandma and my mom and feel like I have a little piece of them with me. This cake is a super moist cake that’s loaded with chunks of cherries. It’s the perfect cake for potlucks, picnics, or parties because who can say no to chocolate cake. If chocolate and cherries are your jam, you may also enjoy this Black Forest Poke Cake and Cherry Brownie Trifle. A rich chocolate cake filled with chunks of cherries. It's the perfect cake for picnics, potlucks, and parties. Preheat oven to 350 degrees. Grease and flour a tube pan. Combine cake mix, pie filling, almond extract and eggs. Stir by hand until well mixed. Pour into prepared pan. Bake 35-40 minutes. While cake is cooling, bring sugar, milk, and butter to a boil over medium heat, boil one minute. Remove from heat and stir in chocolate chips and vanilla. Pour over cooled cake. 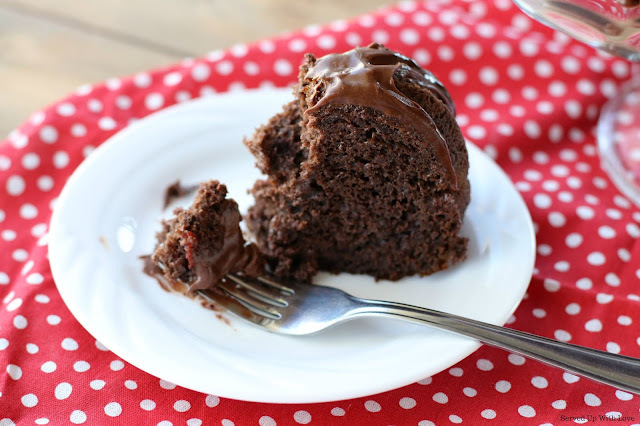 Optional glaze - take a can of chocolate frosting and heat it up in the microwave until runny. Pour over cake. 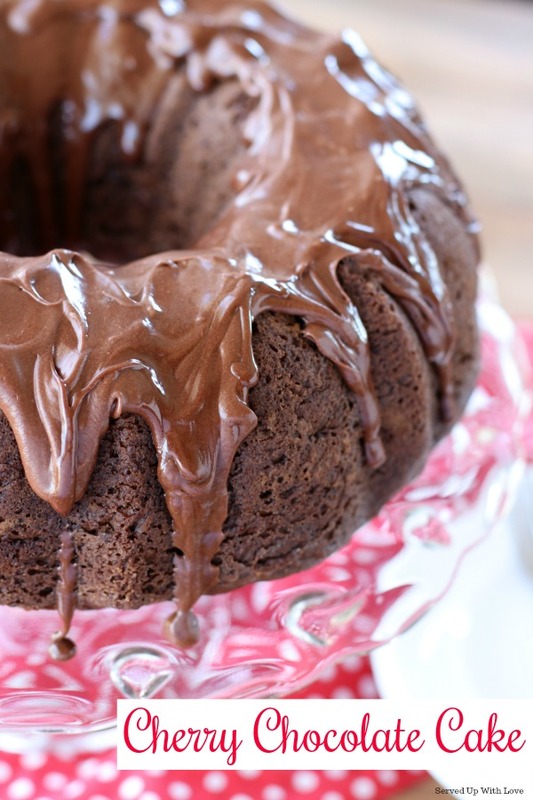 This is so pretty, and it sounds super moist and delish! Great recipe! Such a gorgeous Bundt cake...much prettier than in a 9 x 13! My sister bakes chocolate cake for our mom during Valentine’s day! She makes the frosting extra special to convey her love for our mother. I’ll suggest she make cherry chocolate cake next time. This sounds so yummy and I have all the ingredients on hand to make this for Valentine's day. Question, could you make this using a different flavor of cake mix and pie filling?